Christmas Treats: Honey Glazed Baby Carrots - Simply Fahad-istic! 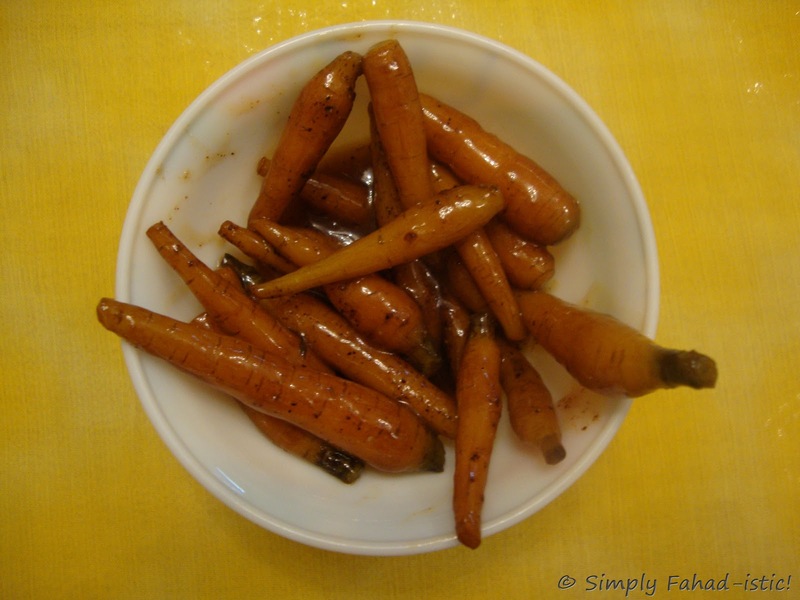 The honey and butter used in glaze perfectly complements the sweetness of baby carrots. Baby carrots cooked in aromatic stock to perfection,tossed in a divine silky glaze sauce and served hot with a sprinkling of fresh ground black pepper.Whether you are cooking a turkey this Christmas,or beef,ham or pork,or simply a vegetarian festive feast,these carrots will add color and texture to your spread.And win you a lot of praise,for sure! 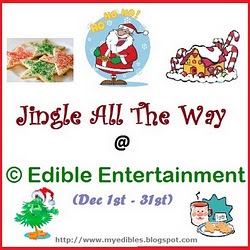 I am also sending this recipe to Kavi's Jingle All The Way event. Place the baby carrots in a pan,cover them with vegetable stock/1 and 3/4 cup water and stock cubes and add the butter and brown sugar.Season with salt,carefully since stock cubes usually contain salt.Bring it to a boil on high heat,and then lower the heat to medium.Cover the pan and cook for ten minutes,adjusting the time by a few minutes more or less,depending on whether you like your vegetables to be soft or crunchy. 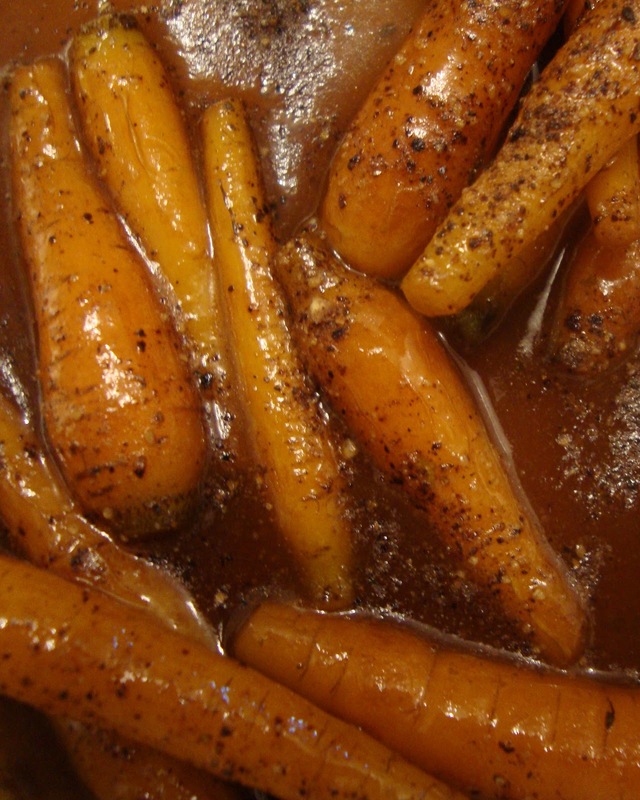 Once the carrots are done,remove them from the pan using a skimmer.Reduce the heat to low,and add the amber colored,smooth honey.Continue cooking till the liquid reduces to a glistening,syrupy,flowing glaze.Return the boiled orange beauties back to the pan and allow them to heat through.Sprinkle with freshly ground pepper and get ready to win everyone's praise! 1. Vegetable stock can be substituted with white chicken stock if you don't necessarily want a vegetarian preparation. 2. If desired,sprinkle some chopped parsley or mint before serving. Add a splash of orange juice and dash of grated orange rind to give the dish a fruity dimension. Simply beautifull! nice recipe to eat it differently! i love carrots.. it must be very fresh and sweet. thanx for sending it to my event.